Aussie found support in Chinese optimistic officers, rising gold prices. AUD/USD advance stalled at a critical juncture, trading within familiar levels. The AUD/USD pair trimmed Friday's losses and settled a couple of pips above the 0.7100 figure, finding some strength during the Asian session on comments from the Chinese premier Li Keqiang, who said that China had the ability to resist downward pressure on the economy to provide additional support to the currency, bringing relief to the Aussie. A strong advance in gold prices, with spot trading at fresh 1-month highs in the 1,322.00 area, also backed the commodity-linked currency. Australia didn't publish macroeconomic data at the beginning of the week, and for this Tuesday, the only event scheduled is a speech from RBA's Ellis. The pair advanced within range, stalling around a critical figure that so far can't clearly break. 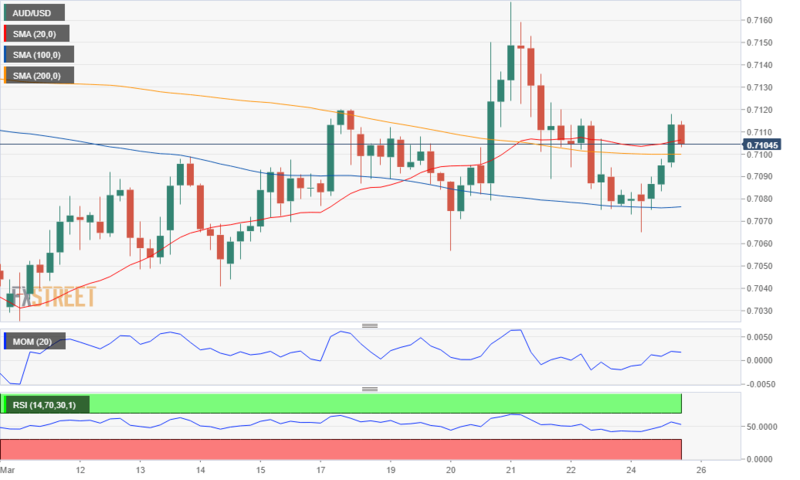 The short term picture suggests that bulls' conviction has already begun easing as, despite the price is now above all of its moving averages, technical indicators are losing upward momentum, with the RSI now gyrating south at around 53. The downside potential will remain limited as long as the price holds above 0.7055, the level to break to open doors for a steeper slide.